Edinburgh's got it all! There is so much to do in Edinburgh, you simply won't have the time! Our guests are always asking for our recommendations, so here's our quick 'Tourist Information' guide to some of the Capital's highlights. The City of Edinburgh is one of the most vibrant, cosmopolitan cities in Europe and is regularly voted as one of the most desirable places to live in the world. Edinburgh Castle dominates the urban skyline, perched atop an ancient volcano right in the city centre! With its stunning Georgian and Victorian architecture, and winding medieval streets and closes, the city is blessed with a truly captivating setting. Edinburgh is bustling with arts, culture, sports and attractions and is famous for playing host to the world's largest arts festival, the Edinburgh International Festival. Scroll down for a quick run down of what's on in Edinburgh. ApartmentsInEdinburgh.com are providers of cheap Edinburgh accommodation, only a few minutes walk from many of the city's major attractions, so if you're visiting get in touch with us for our latest offers! 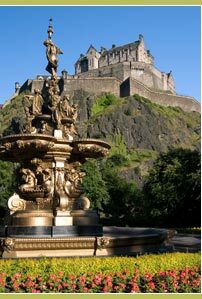 Edinburgh Castle from the Ross Fountain in Princes Street Gardens - Scotland's most-visited tourist attraction, Edinburgh Castle Scotland is an ancient fortress rising high above Edinburgh City on the sheer cliffs of Castle Rock. 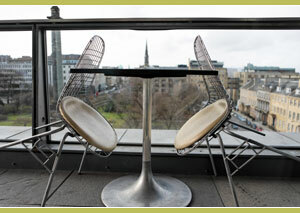 Its lofty position dominates views of the city of Edinburgh. The esplanade of Edinburgh Castle is the site of the world-famous 'Edinburgh Castle Tattoo' (Edinburgh Castle Military Tattoo). Guided tours of Edinburgh Castle are available. The castle is managed by Historic Scotland. 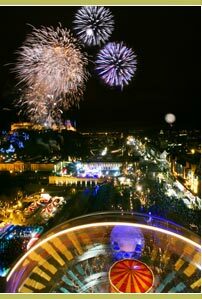 Edinburgh's Hogmanay Street Party - One of the world's most spectacular New Year celebrations! The evening features performers from all over the world, and the Concert in the Gardens with a world-class fireworks display at midnight. Street party tickets are released at the beginning of October each year. New Year's Eve is preceded by the Torchlight procession from the Royal Mile and Night Afore International, a street arts carnival on George Street. Visit Edinburgh's Hogmanay website for details. 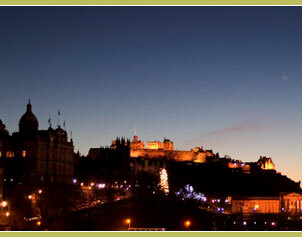 Our apartments offer ideal Edinburgh Hogmanay accommodation, in the city centre. The Royal Mile - Our self-catering apartments are near to Edinburgh's Royal Mile in the Old Town - the city's most popular tourist street. The Mile runs from the Castle Esplanade to the Palace of Holyroodhouse, encompassing the Lawnmarket, the High Street, and Canongate. 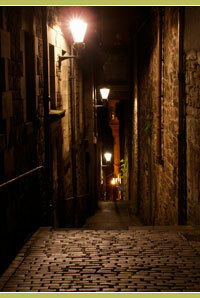 Don't forget the side streets of Victoria Street, the West Bow, Candlemaker Row, Grassmarket and the West Port. These delightful areas are rich in unusual shops, pubs, restaurants and cafes. During the Edinburgh Festival Fringe, the High Street becomes crowded with tourists, entertainers and buskers. Palace of Holyroodhouse (Holyrood Palace) - At the foot of the Royal Mile, Holyrood Palace, dating from the 15th century, is the official residence of Queen Elizabeth II when she visits Scotland. She is usually in residence for a few weeks in May and July each year. When the Queen is not present, areas of the palace are sometimes open to visitors with guided tours of several rooms in the State Apartments available. 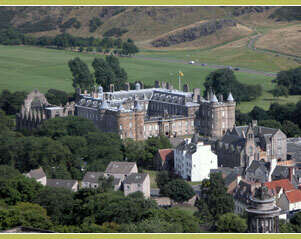 The palace is directly opposite the Scottish Parliament and Arthur's Seat. With our self-catering accommodation in Edinburgh's Regent Terrace you can stay only a short walk from Holyrood Palace and the Royal Mile! See our map of Edinburgh to see where we are. Rosslyn Chapel - Rosslyn Chapel is a 15th century church in the village of Roslin, on the outskirts of Edinburgh. As of 2006, the chapel attracts over 100,000 visitors per year, many of whom are intrigued by the building's connection with the 2003 bestselling novel, The Da Vinci Code by Dan Brown. Trained staff are on hand to guide you round the chapel on your visit. You can reach the chapel by the hourly 15A bus which can be boarded at St. Andrew's Square or Princes Street (between 3 and 8 minutes walk from our self-catering apartments). 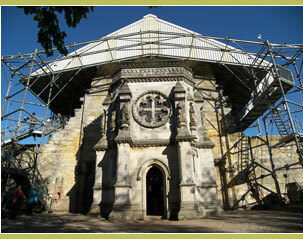 The Rosslyn Chapel image above shows a roof erected over the chapel as part of the ongoing conservations project. Visit the official Rosslyn Chapel website here. Scott Monument - Rising 200.5 feet into the sky in the East end of Princes Street Gardens, only a few minutes walk from our Calton Hill self-catering apartment, the Scott Monument is a Victorian era monument to Scottish author Sir Walter Scott. For a small fee, you can climb 287 narrow spiralling steps to the viewing deck near the top for a panoramic view of central Edinburgh. The monument lies opposite the Jenners department store on Princes Street and near to Waverley Station. Visit the small official webpage here. Princes Street Gardens - Take a stroll in this dramatically situated public park beneath the ramparts of Edinburgh Castle. The Gardens are a popular meeting place in Edinburgh, and play host to regular concerts at the Ross Bandstand, particularly at the city's Hogmanay celebrations. Pop over to take in the oldest floral clock in the world, which is seasonally replanted with around 35,000 colourful plants. Come Christmas time, Princes Street Gardens is also the site of one of Britain's largest outdoor ice rinks, Winter Wonderland. 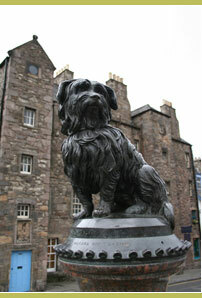 Greyfriars Bobby Statue - Just outside Greyfriars Kirkyard, this statue stands in memory of the famous terrier 'Bobby', who, as the story has it, was so devoted to his master, that for fourteen years he lay on his master's grave only leaving for food. Guided tours of the kirkyard are given by Greyfriars Kirkyard Trust. A spooky close in the Royal Mile - Take a walking tour around the most haunted locations of Edinburgh's Old Town with Mercat Tours.. You'll be treated to scary stories and underground vaults. Or step into the darker side of Scotland's past at The Edinburgh Dungeon, the Capital's famous horror attraction. 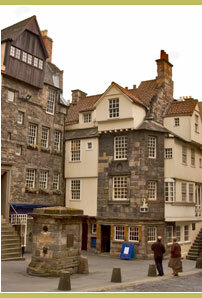 John Knox House Museum - the museum, on the Royal Mile, holds an exhibition about the life and times of John Knox, who used to live in this 15th century building. Knox was leader of the Scottish Reformation and founder of the Presbyterian Church. Edinburgh Military Tattoo - Throughout August every year, the iconic Scottish spectacle that is the Edinburgh Tattoo enthrals audiences on the Edinburgh Castle esplanade. Join an audience of thousands perched high above Edinburgh city centre to watch at first hand a display which attracts an annual television audience of 100 million worldwide. 1000 or so performers conduct a dazzling show on the Castle Esplanade, an assortment of vibrant dance, music and display. From daredevil motorcycle stunts and battle re-enactments, or Russian Cossack dancers and Chinese dancers, or simply the best of Scottish - Highland marchers, dancers, and bandsmen, the programme assortment changes every year. Penultimately, a spotlight illuminates the Lone Piper on the Castle ramparts, who plays a hunting farewell before fireworks light the night sky. 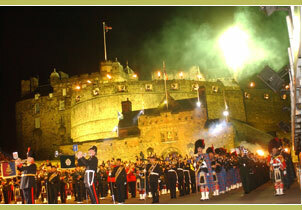 Visit the Edinburgh Tattoo official website where you can find out how and when to buy your Edinburgh Tattoo ticket. Edinburgh Hogmanay Street Party Fireworks - At midnight on 31st December every year, the Edinburgh Hogmanay fireworks, one of the world's most spectacular firework displays, sets the winter sky alight with colour. The display is also known as the 'Seven Hills Fireworks' as there are actually seven launch sites: Arthur's Seat, Blackford Hill, Braid Hill, Calton Hill, Castle Hill (Edinburgh Castle - the main display), Corstorphine Hill and Craigmillar Hill. If you wish to watch the display from the very town centre, then you will need to obtain Street Party tickets (allocated by postal ballot in October every year or included with certain Hogmanay ticketed events, like the Concert in the Gardens). However, this sparkling spectacle can be seen for miles around, and popular vantage points outside the ticket zone include Calton Hill, Arthur's seat and Inverleith Park. 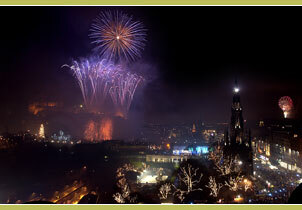 Visit the Edinburgh's Hogmanay website for full information. 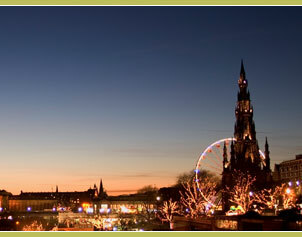 We offer ideal Edinburgh Hogmanay accommodation in our city centre self-catering apartments. Harvey Nichols Edinburgh - 'Forth' Floor Restaurant - Edinburgh is now a shopping mecca, with a massively diverse range of goods available. Shop for the latest fashions and luxury goods at the Harvey Nichols department shore, then dine out in style in the Forth Floor Restaurant with views up to Edinburgh Castle and, as the name suggests, over the Firth of Forth. Just round the corner, another luxury shop in Edinburgh, Louis Vuitton is a renowned maker of luxury bags and luggage. The Princes Shopping Mall and the St. James Shopping Centre, in which you will find John Lewis, carry a huge variety of wares and offer mall shopping right in the city centre. On Princes Street, you will find Jenners, Marks and Spencer, and also Debenhams and House of Fraser where you will find Edinburgh Crystal for sale. Go shopping in Edinburgh on the Royal Mile, for shops that stock goods made in Scotland. 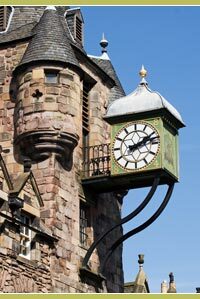 Pop into Royal Mile Whiskies, The Edinburgh Woollen Mill or The Kiltmaker. From antiques, Scottish cashmere sweaters and tartan woollen products, Scottish music, gifts made in Scotland, to Scottish bagpipes and kilts, it's all here! If you plan on doing a lot of Edinburgh shopping, then our self-catering flats and guest houses offer ideal Edinburgh shopping accommodation close by! National Monument on Calton Hill, Edinburgh - Calton Hill at the East end of Princes Street, includes several buildings of interest, notable for their Greek-influenced architecture. Of course, the hill also offers superb views right over Edinburgh city centre, and is a popular vantage point for the Edinburgh Festival Fireworks and Edinburgh's Hogmanay Fireworks. On the summit of the hill, The National Monument, pictured above, is Scotland's memorial to those who lost their lives in the Napoleonic Wars. 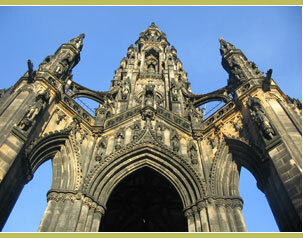 It is famous for being only partially complete due to lack of funding at the time, which leads to its more popular name "Edinburgh's Disgrace". Also of interest is Nelson's Monument, a tower which commemorates Admiral Horatio Nelson's victory over the French and Spanish fleets at the Battle of Trafalgar in 1805. The monument was designed to look like an upturned telescope. Nowadays, Calton Hill is perhaps most famous for The Beltane Fire Festival, which is held every year on the night of 30th April to mark the Summer Solstice. An audience of around 15 thousand people come to share in the fire festival and the intense and colourful procession of painted dancers and drummers. You can find out more at the Beltane Fire Society. 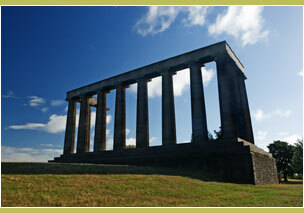 Our self-catering apartments are located around the base of Calton Hill. 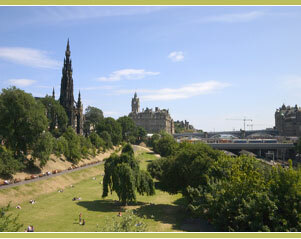 In particular, our Calton Hill Apartment offers perfect Beltane Festival accommodation! National Gallery of Scotland - Being a city with such a colourful past, Edinburgh boasts an immense variety of galleries and museums. The National Gallery of Scotland, stands in all its grandeur on The Mound between East and West Princes Street Gardens. Its collection contains over 20,000 paintings and drawings, and there are regular exhibitions of world-renowned collections. The Scottish National Portrait Gallery on Queen Street is host to the national collection of portraits, all of those being of Scots, in addition to the Scottish National Photography Collection. 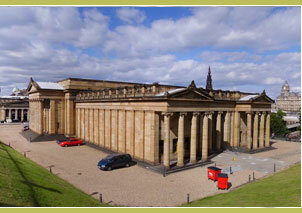 The Museum of Scotland on Chambers Street is dedicated to the history, people and culture of Scotland through the ages. This modern museum is an unusual and striking structure in Edinburgh's historic Old Town. Discover how scotch whisky is made and experience the sights and smells of this Scottish favourite at the Scotch Whisky Heritage Centre (website). Peruse works and personal artifacts of the Scottish literary greats, including Robert Burns and Sir Walter Scott, at the Edinburgh Writer's Museum (website). And much, much more! Admission to many of the city's museums and galleries is free. A charge may be made for special exhibitions. Details are at the National Galleries official website, the National Museums of Scotland and the City of Edinburgh Museums & Galleries. The Scottish Parliament, Holyrood - The Scotland Act of Parliament 1998 saw the establishment of a new devolved Scottish Parliament in 1998 in Edinburgh, Scotland's capital city. The modern Edinburgh Parliament was created to deal with matters devolved to it by the UK Parliament, and it has since passed many new laws. 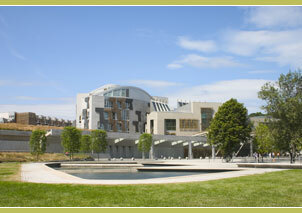 The Queen opened the unusual and controversial �400m Scottish Parliament building on 9th October 2004. It was designed by Catalan architect Enric Miralles, and features leaf-shaped structures, upturned boat-shaped skylights, and bamboo fixtures. The parliament building is open to visitors and on business days, you can visit the public galleries of the Chamber or Committee rooms to see Parliament and its MSPs in action. On non-business days, the Chamber and Committee Room public galleries are open for visitors to see. Staff are available to answer questions, and tours are available of the Main Hall, the floor of the Debating Chamber, the Committee Rooms, the MSPs office block and the historic Queensberry House. There is also a shop and caf�. For full details visit the Official Scottish Parliament website. Edinburgh International Festival - The Edinburgh International Festival runs over a three week period throughout mid-August to early September every year. 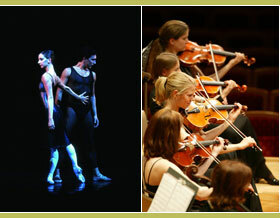 It consists of a vibrant programme of theatre, classical music, dance and opera in major theatres and concert halls and a number of smaller venues throughout Edinburgh. The Edinburgh Festival Fringe runs throughout August and alongside the Edinburgh International Festival. It is considered the largest arts festival in the world with over 28,000 performances, 17,000 artists, 261 venues and 1.5 million tickets sold during the latest festival. The High Street in The Royal Mile functions as the epicentre for much of the outdoor performances to be seen in the Edinburgh Fringe. Wander through the crowds for hours and admire the fire eaters, stilt walkers, and street performers of every kind! Other cultural events including the Edinburgh Book Festival and the Edinburgh Film Festival take place throughout the August festival season. Visit the Edinburgh International Festival website and the Edinburgh Festival Fringe website. If you are looking for Edinburgh Festival apartments, then our self-catering flats in Edinburgh make ideal Edinburgh festival accommodation and Edinburgh Fringe accommodation. Edinburgh Festival Fireworks - Also known as The Bank of Scotland Fireworks Concert, this magnificent display is recognised as one of the world's greatest fireworks concerts and is the finale to the Edinburgh International Festival. It is choreographed to a live orchestral performance in Princes Street Gardens "The Concert in the Gardens", and regularly attracts audiences of over 250,000 people viewing from various vantage points across the capital. 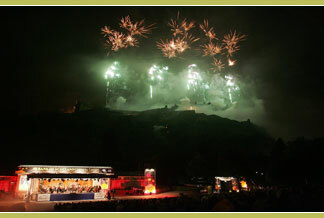 The Edinburgh Festival Fireworks Concert is the largest fireworks display of its kind in Europe with over 100,000 fireworks set off from the Castle equating to 4.5 tonnes of explosives. Festival Fireworks tickets to Princes Street Gardens and the Ross Band Stand can be obtained from the Edinburgh International Festival Hub Tickets, The Hub - you are advised to pick them up early as every year, there are last minute queues of hundreds for the last tickets! For those without tickets, ideal free vantage points are to be found on Calton Hill, Arthur's Seat and Inverleith Park, and of course Princes Street. In Inverleith Park, an official 'family viewing area' is organised; a giant screen relays close-up images of the fireworks and the park itself offers stunning views of the Edinburgh skyline and Edinburgh. Again, those looking for Edinburgh Festival accomodation, or Festival fireworks accommodation will find our self-catering apartments situated around the base of Calton Hill ideal. 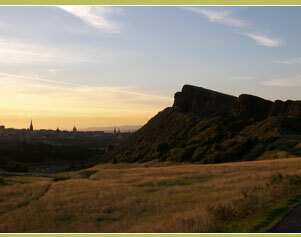 Salisbury Crags, Arthur's Seat & Queens Park - Take a stimulating walk in The Queen's Park (more commonly known as Holyrood Park), a remarkably wild piece of highland landscape set right in the centre of the city of Edinburgh. The park is only about 7-8 minutes walk from our self-catering accommodation in Regent Terrace. Climb the main peak of Arthur's seat which rises above the city to a height of 251 m (823 feet), providing wonderful panoramic views. From some angles, some say Arthur's Seat resembles a sleeping lion. Like the castle rock on which Edinburgh Castle is built, it was formed by an extinct volcano. It's a fairly easy climb and a very popular one. Queen's park also contains three lochs: Duddingston Loch, which is a bird sanctuary, together with Dunsapie Loch, set half way up Arthur's seat itself, and St. Margaret's Loch. 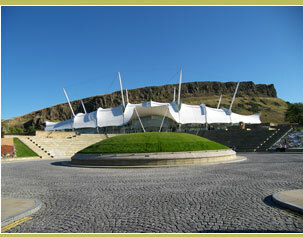 Our Dynamic Earth - Situated spectacularly in front of Salisbury Crags and beside the new Scottish Parliament at Holyrood, the Our Dynamic Earth Edinburgh science exhibition makes for a stimulating day of discovery for all the family. You can experience time travel, journey to the centre of the Earth, become an astronaut or explore a tropical rainforest! Take a helicopter flight across Scotland's ever-changing landscape, explore the ocean depths, come face to face with a dinosaur, or do some fossil rubbing! 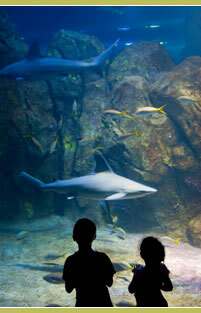 Facilities include the Natural Selection Gift Shop, Food Chain Cafe and Ocean Commotion Soft Play Area. The Our Dynamic Earth exhibition is very close to our vacation rental apartments and accommodation in Regent Terrace, only about 7-8 minutes walk away, and at the foot of the Royal Mile. Visit the Our Dynamic Earth website. 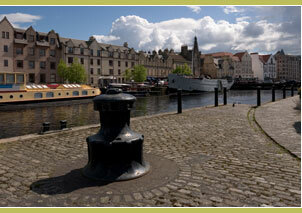 Leith Waterfront & Docks - Make a trip down to Leith, the sea port of Edinburgh. You'll find a thriving district of Edinburgh that has seen many developments in shopping, leisure and entertainment in recent years. Numerous pubs and restaurants line the waterfront and the local cuisine offers fresh seafood and other Scottish dishes. Leith is also home to Ocean Terminal, a stylish �120m waterfront shopping mall, which incorporates The Royal Yacht Britannia. Step on board the ship that was once home to the world's most famous royal family! If you're visiting in June then you'll be able to enjoy the Leith Festival which sees 180 events in 60 venues over the course of 10 days. There is a considerable amount of holiday accommodation in Leith, though our self-catering apartments are located close to the top of Leith Walk, with the waterfront and docks only a 10 minute bus ride away. The Royal Yacht Britannia - Berthed in Leith, Edinburgh, just 2 miles from the city centre, sits The Royal Yacht Britannia. For over forty years The Royal Yacht proudly served the Royal Family, sailing over one million miles to become the most famous ship in the world and playing a role in some defining moments of recent history. Britannia's Visitor Centre on the second floor of Ocean Terminal provides historical background, and photographs of the Royal Family. Visitors then collect an audio handset tour (available in many languages and for children), and step on board to discover Britannia's five decks. Highlights of the tour include the Sun Lounge, the State Dining and Drawing Rooms, The Queen's Bedroom, which contrasts with the working side of the ship, such as the Royal Marines' Barracks, the Sick Bay and the Engine Room. You can't go wrong with a trip out to this award-winning attraction rated "Five Star (Exceptional, World Class) Visitor Attraction" by the Scottish Tourist Board. 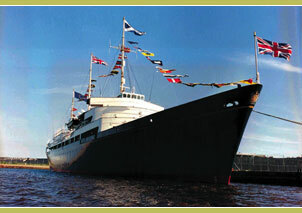 Visit the official Royal Yacht Britannia. Left: Deep Sea World - Dramatically situated underneath the Forth Rail Bridge, Deep Sea World in Queensferry, Fife is an experience like no other. Featuring the world's longest underwater aquarium viewing tunnel and a fascinating array of marine life, you'll be truly amazed. Facilities include the Lagoon cafe, souvenir shop and lots more to see and do, including watching the divers hand feed the sharks! 20 mins drive from Edinburgh city centre or 15 mins by train. Deep Sea World. Right Top: A Polar Bear at Edinburgh Zoo - Edinburgh Zoo in Edinburgh is the largest and most exciting wildlife attraction in Scotland. In just one day, you can meet over 1,000 amazing animals, in a beautiful parkland setting on Corstorphine Hill in Edinburgh. You can also enjoy a wide range of visitor facilities, from free Hilltop Safari rides to the top of the hill, children's play areas, restaurants, gift shops and masses of events and activities throughout the year. Many people look for hotels near Edinburgh zoo or Edinburgh zoo hotels, but our self-catering apartments offer ideal Edinburgh accommodation. 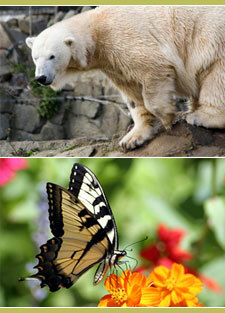 The Zoo in Edinburgh is a 15 minute bus ride from Princes Street, Edinburgh's main street. Visit the Edinburgh Zoo website. Right Bottom: Edinburgh Butterfly World - At Dobbies Garden World on the outskirts of Edinburgh. Marvel at butterflies emerging, handle the snakes and tarantulas and see the leaf-cutting ants trail across one side of the room to the other! Visit Edinburgh Butterfly World. Copyright Notice. Please note that images on this page are either � ApartmentsInEdinburgh.com, or are used under license with the express permission of the copyright holder(s). In particular, we are grateful to The Edinburgh Military Tattoo, The Royal Yacht Britannia, Edinburgh International Festival (Photo credits: Peter Sandground, K Miura and Catherine Ashmore) and Edinburgh's Hogmanay for supplying us with images, which are used with permission. Please do not infringe copyright by copying images from this webpage. Thank you.